The lab where wrinkle-erasing wonder drug Botox is made is shrouded in secrecy, said writer Cynthia Koons. That’s because the process involves a toxin so deadly that a single crystallized gram could kill 1 million people. THERE’S NO EASY way into Allergan’s Botox laboratories in Irvine, Calif. And once you’re inside there’s no quick way out. But first things first: Here’s a waiver acknowledging that within 18 to 36 hours of entering the secured labs, you could develop symptoms including double vision, difficulty speaking, arm or leg weakness, and eventual paralysis of your respiratory system. Try not to worry. Assume you sign the form and move on. The initial entryway is fitted with keycard- activated doors, beyond which are more doors guarded by PIN pads, followed by still more keycard entry points and more PIN pads. There are only a few people at work or walking around. Deep inside, behind double-paned windows, are still more glass barriers and, finally, metal-enclosed workstations. Everything is under video surveillance. All activity is measured and monitored. Guards watch the comings and goings from a room filled with banks of screens. All this scrutiny and precaution isn’t there to protect Allergan’s wildly popular drug from competitors, though it is worth protecting— last year, Botox generated $2.8 billion in sales. Rather, the security exists because the drug that can take years off a person’s appearance by erasing wrinkles also happens to be made with one of the most toxic substances known to science. Botox is derived from a toxin purified from Clostridium botulinum, a bacterium that thrives and multiplies in faultily canned food (and sometimes prison-made booze). The botulinum toxin is so powerful that a tiny amount can suffocate a person by paralyzing the muscles used for breathing. It’s considered one of the world’s most deadly potential agents of bioterrorism and is on the U.S. Centers for Disease Control and Prevention’s select-agent list of heavily regulated substances that could “pose a severe threat to public, animal, or plant health.” Because of that, Allergan must report to the CDC if even a speck of the toxin goes missing, and when it’s sent to Allergan’s manufacturing facility in Ireland, its travels bring to mind a presidential Secret Service operation. A baby aspirin–size amount of powdered toxin is enough to make the global supply of Botox for a year. That little bit is derived from a larger primary source, which is locked down somewhere in the continen tal U.S.—no one who isn’t on a carefully guarded list of government and company officials knows exactly where. Occasionally (the company won’t say how frequently), some of the toxin (the company won’t say how much) is shipped in secrecy to the lab in Irvine for research. Even less frequently, a bit of the toxin is transported by private jet, with guards aboard, to the plant in Westport, Ireland. THERE ARE HUNDREDS of botulism poisonings annually in the U.S. alone, and a couple of times a year someone dies. In a typically random case, a man passed away earlier this year after eating tainted nachos at a gas station outside of Sacramento. It was the cheese sauce. Around 1820, Justinus Kerner, a German doctor and poet famous for his supernatural and melancholy romantic verse, published the first accurate description of the symptoms of what he termed Wurstgift, or “sausage poisoning”: drooping eyelids, accompanied by difficulty swallowing and breathing. Near the end of the century, a group of musicians playing at a funeral developed double vision and muscle paralysis after eating a ham. At least three died. From that tragedy, Emile Van Ermengem, a microbiology professor in Belgium, identified C. botulinum. He is credited with giving the pathogen its name, deriving it from the Latin word for sausage: botulus. U.S. government concern about the weaponization of botulinum isn’t fanciful. After prodding by United Nations inspectors, Iraq admitted to refining large quantities of the toxin prior to 1991 for use in some of its 25 Al-Husayn warheads, part of a biological weapons program. Earlier, fears that Nazi-era Germany had a stockpile of botulinum led to the development of a vaccination for Allied troops. It was readied in advance of D-Day, but intelligence reports ruled out the use of botulism-tipped weapons and the vaccine wasn’t administered. It was also during World War II that the U.S. started studying the toxin for biological weapons of its own, work that indirectly led to the creation of Botox. Botox is largely the brainchild of two scientists, Alan Scott and Ed Schantz, who approached the toxin with completely different goals. In the 1960s and ’70s, Scott, an ophthalmologist, was looking for a treatment for people with strabismus, or crossed eyes. Schantz’s focus was more military than medical; he’d done work purifying the botulinum toxin in the Chemical Corps at Fort Detrick in Frederick, Md., home of the U.S. biological weapons program, before moving to the University of Wisconsin, where he perfected the process. Schantz became a supplier of the toxin to Scott after a colleague put the two in touch. Back then, controls for shipping botulinum were next to nonexistent. Schantz sent the stuff, in crystalline form, to Scott via the U.S. Postal Service in a metal tube slipped inside another metal tube. It was Scott who turned the toxin into a pharmaceutical. He then formed a company around his breakthrough, called Oculinum Inc. The drug, also called Oculinum, was approved in 1989 for strabismus and blepharospasm, or twitchy eyelid. Allergan licensed it from Scott, then bought it outright in 1991. (The name was changed to Botox the next year.) From the start, Allergan took a cautious approach to a substance it recognized had the potential for grave harm if misused. “It’s always been an issue. We’ve certainly known it’s one of the most potent drugs in the world,” says Gavin Herbert Jr., former longtime CEO and son of the company’s co- founder. Mitchell Brin, Allergan’s chief scientific officer for Botox, has played a critical role in the drug’s development almost from the beginning. In the 1980s he was a neurologist at Columbia University specializing in movement disorders. He and his colleagues got their supply from Scott, who’d gotten U.S. regulatory approval to evaluate the use of his drug on human subjects. Brin began testing it on patients with severe muscle contractions in the face, jaw, neck, and limbs. His awe over its power hasn’t waned—he still enjoys showing old before-and-after films of patients whose spasm disorders were quelled by Botox in some of the earliest days of the drug. The drug works like this: A person’s muscles are controlled by motor nerves, which release a chemical that instructs the muscles to contract. 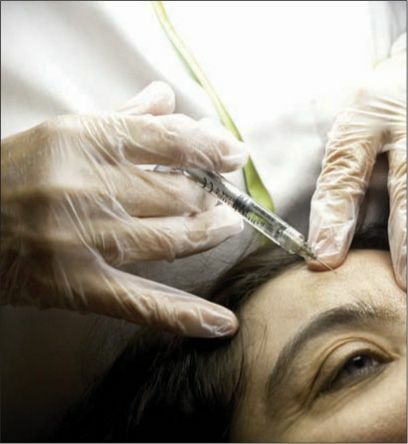 Botox blocks the release of that chemical. Today it’s approved for nine different medical uses—including treatment for chronic migraines, overactive bladders, and severe muscle spasms—and is in trials for use in treating depression. It’s also being studied for atrial fibrillation, or AFib. Cosmetic uses are likewise expanding: The next frontier is the saggy neck and the toosquare jaw. Herbert says that when Allergan first acquired Botox, he thought it could do $10 million in annual sales. Now it’s on track to grow to almost $4 billion by 2020. As is often the case with blockbuster drugs, Botox’s story has a chapter on an entirely accidental discovery. It was a doctor couple, Jean Carruthers, a Vancouver ophthalmologist, and her husband, Alastair, a dermatologist, who stumbled on Botox’s anti-aging properties. Jean was treating a patient with eye spasms. The woman protested at one appointment when she wasn’t given a shot in her brow; she said injections in that spot gave her a “beautiful, untroubled expression,” Jean recalled in a TEDx Talk in 2012. At the same time, Alastair was looking for a better treatment for deep frown lines. The two teamed up to examine the use of Botox in forehead creases. Their receptionist was the first patient. Within days, she had a smoother forehead and a “refreshed, open, younger expression,” as Jean puts it now. But finding customers willing to be injected in the face with poison wasn’t easy. So Jean decided to use the drug on herself, and soon there was no shortage of takers. “I haven’t frowned since,” she says, laughing. Full list price for Botox is roughly $600 per treatment, according to the research firm SSR LLC, and this drug sells at full price more often than most. Roughly 55 percent of the business, by revenue, is for medical treatments. The other 45 percent is cosmetic procedures, which aren’t covered by insurance. Patients pay full fare for the drug, plus what their doctor charges. IT’S PROBABLY FROM somewhere near Irvine that the botulinum toxin starts its journey to the plant in Westport. The company won’t say where in Ireland the toxin makes landfall or how it makes its way from there to Westport. 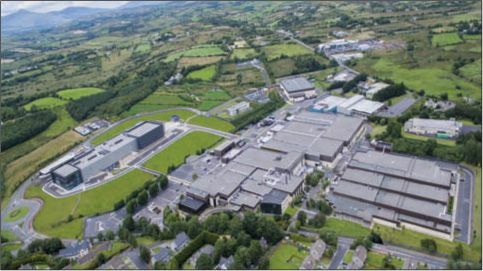 “It never leaves Allergan’s control,” says Paul Coffey, general manager of Allergan’s Westport facility. “There would be a very small number of people who are aware of the shipment.” And it would be a rare event—there can be a year or more between deliveries. Coffey likens the security inside the facility to the layers of an onion. “Where we store our purified toxin is in the middle of the onion,” he says. The storage room for the toxin is monitored by cameras that, in addition to guarding the company’s greatest asset, are used to help engineers diagnose equipment problems remotely. The rare few employees who have access to the room enter only after they’ve stripped off their street clothes and suited up in full surgical garb. From the core of this security onion, the toxin begins its trip back into the world, in a busy plant that employs more than 800 people. The first step in making the drug is to combine saline solution with an almost incomprehensibly minuscule quantity of the purified toxin. The liquid flows through a series of pipes into a sterile filling room. These rooms are monitored for temperature, humidity, differential pressure, nonviable particulates, and other factors. The company takes some 16,000 samples a month across these “clean rooms” to test for bacteria in the air. It’s a largely automated process that’s tracked by microscopic cameras embedded in the machinery. In the final steps, the saline solution is shot into tiny glass bottles and then reduced to a fine powder. Those bottles, individually boxed, are what doctors around the globe receive. One of the most feared substances on earth is now largely neutered, immensely valuable, and ready to be injected into a wrinkled brow or a sweaty palm. No need for guarded private jets now. FedEx will do.